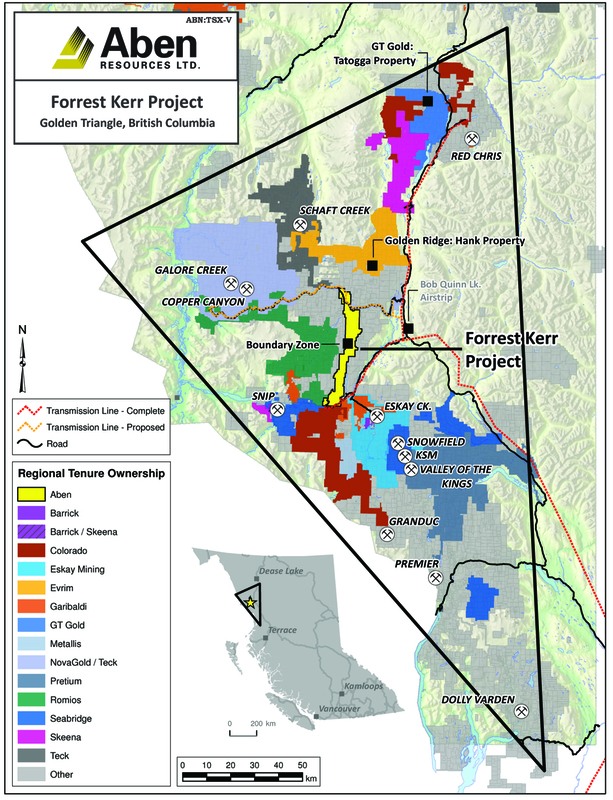 Vancouver, BC -- Aben Resources Ltd. (TSX-V: ABN) (OTCQB: ABNAF) (Frankfurt: E2L2) (the "Company") reports further results from the recently completed drill program at the Forrest Kerr Project. Drilling has extended the mineralized envelope surrounding the 2017 and 2018 high-grade gold discoveries at North Boundary. This round of focused drilling tested for the depth and lateral extension of known mineralized shear and vein sets located in the North Boundary Zone. Broad horizons of low to moderate grade gold mineralization were encountered in several of the 15 drill holes (FK18-22 to 36) reported herein, while all drill holes encountered discrete polymetallic vein hosted mineralization with gold values ranging from trace amounts to 13 grams per tonne (g/t) over 1 meter. President and CEO, Jim Pettit states: "The 2018 season has been a geologic and technical success in terms of what we have accomplished this year. We started out with a 5000 meter drill program and expanded it to 10,000 meters after success with the drill. We raised $5.2 million and an additional $1.7 million from the exercise of warrants. Logistically, we adapted quickly and efficiently on the fly and actually substantially reduced our overall cost of drilling per meter. 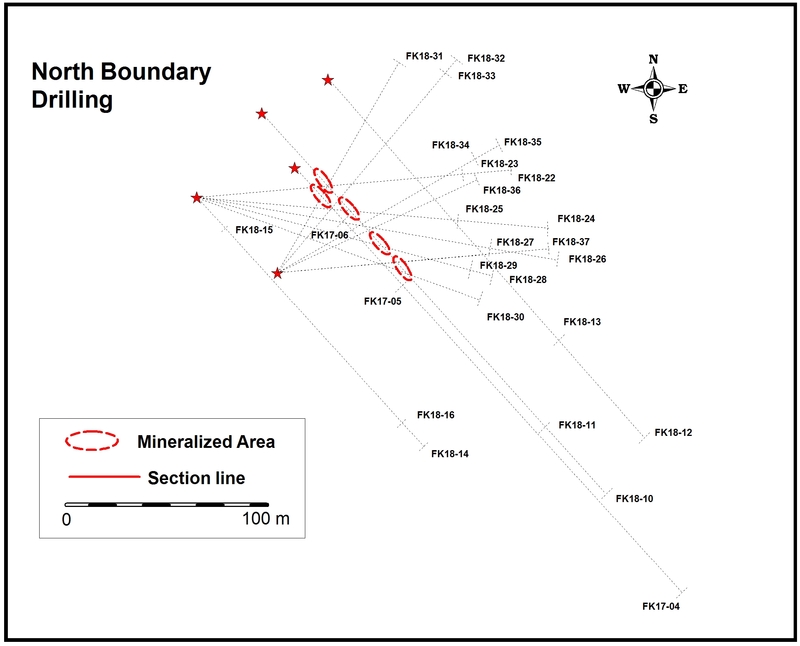 We have identified the Boundary Zone as a very large, robust environment for gold mineralization and discovery. We have 9 more holes to report on from this season and we look forward to compiling all the data available to us generated from this 2018 drilling program as well as new geochemical and geophysical analysis. It is also important to note we have the funds in the treasury for the 2019 exploration and drill program." All 1 or 2 meter drill core samples were delivered to ALS Global prep facility in Terrace, British Columbia where they were crushed until 70% passed a 2mm sieve, then a 250g split was pulverized until better than 85% passed a 75 micron screen. Gold was tested via fire assay method Au-ICP21 with all ore-grade samples (> 10 g/t) undergoing fire assay with gravimetric finish. ALS performed multi-element ICP-AES package ME-ICP41 in their Vancouver facility to test for 35 other elements. In addition to the quality assurance and quality control program performed by ALS, Aben personnel insert lab certified standards, field blanks and duplicates into the sample stream at the rate of one QA/QC sample in every 10 samples. Aben Resources is currently finalizing analytical results from field work completed in September 2018 on its 100% owned Justin Gold Property in the Yukon Territory. The geologic team reports visible gold in trenches and channel samples from quartz stockwork veining in bedrock at the Lost Ace Zone, a gold-bearing zone discovered in 2017. Channel sampling in 2017 at Lost Ace returned 1.44 g/t Au over 5m including 4.77 g/t Au over 1.0 m in addition to a bulk soil sample that contained 1135 visible gold grains, the majority of which were termed 'pristine' indicating a proximal bedrock source for the gold. Lost Ace is an exciting new prospect on the Justin Property as it is located within 2km of the main mineralized POW Zone and bears striking similarities to Golden Predators adjacent 3 Ace Property.